In 1950, at age ten, Rudy Timmerman began training in the arts of Jiu Jitsu and Catch as Catch Can in Holland, where he was born. No ranks were awarded to Juniors for training during this time, and GM Rudy Timmerman did not earn his 1st dahn Black Belt in Jiu Jitsu until 1963. He continued training in the art after his arrival in Canada, and he earned his Master rank in Nihon Jiu Jitsu under the late Shinsaku Hogen Hanshi of Tokyo, Japan. 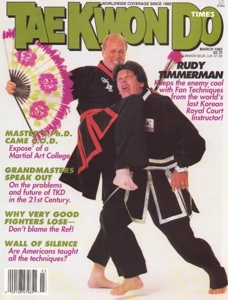 After his family moved to Canada in 1958, Master Rudy Timmerman began to study the arts of Kuk Sool Hap Ki Do and Tae Kwon Do under Grandmasters Pak In Shyuk and Pak Sung Bok, and he attained his first degree black belt (KSHKD) in 1963. During the late 60s and early 70s, GM Timmerman traveled around North America in search of more knowledge and to compete. During his travels, he met, trained with, and/or competed against some of the greatest martial artists of the “golden age” era of martial arts (60s and 70s). GM Rudy Timmerman opened his first school in 1973, and he was a founding member of the Canadian Karate Yudansha Alliance… the brainchild of the late Sensei Robert Dalgleish. GM Timmerman was also quite involved with the Aiki Kempo Association (which later turned into the YKKF). He has also been the Canadian Director for the Korea Kido Association. Presently, GM Rudy Timmerman is an Ambassador for the Canadian Martial Arts Hall of Fame directed by GM Don Warrener, Wally Slocki, and Jean Frenette. He is also on the board of advisors of Hanshi Linick’s KMHOF. After Grandmaster Pak left the area, and KJN Rudy Timmerman was left without an instructor, he sought out GM Suh In Hyuk in order to continue his training in theart of Kuk Sool. 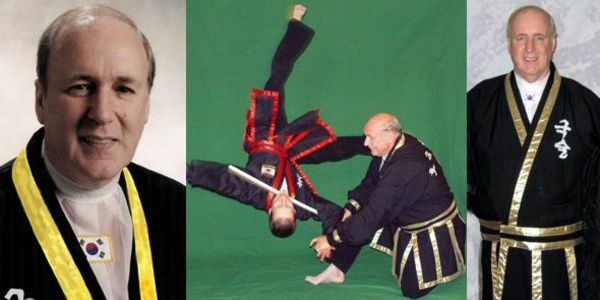 He eventually became the Master in charge of Canada and the State of Michigan for the World Kuk Sool Association, and he worked diligently to spread the art of Kuk Sool until 1998. During this time, he put Kuk Sool on the map in Canada, and he registered no less than 16 schools with WKSA. In 1984 he found Grandmaster Pak in Edmonton, Alberta. There he worked for several months with Grandmaster Pak to train and help Grandmaster Pak finalize the Kong Shin Bup curriculum. While there, he tested and was promoted to 8th dan Kong Shin Bup by Grandmaster Pak. Before he left Edmonton, and because GM Pak had founded a new martial art called Tae Keuk Do, Grandmaster Rudy Timmerman was appointed as the Inheritor of KSBTM Upon his return to SS Marie, GM Timmerman immediately registered the name Kong Shin BupTM with the Canadian Government and trademarked the name; however, out of respect for the founder of the art, GM Timmerman did not assume the position of Inheritor until after GM Pak passed away. Because he did not like the direction WKSA was going, GM Rudy Timmerman left the World Kuk Sool Association in 1998. At that time he assumed the leadership of Kong Shin Bup as its first inheritor; and, in order to provide training and certification to his many students, he began to further develop the National Korean Martial Arts Association he had founded in 1974. In August, 2010, to celebrate his 60th year of martial arts training, GM Rudy Timmerman organized the Gathering of Grand Masters, and hundreds of the old friends he made over the years showed up to celebrate with him. It was an awesome celebration. Over the past sixty years, GM Rudy Timmerman was featured on several magazine covers, inducted in several Halls of Fame, appeared on television and radio shows, received commendations from Heads of State, and several Mayors presented him with keys to their cities. GM Rudy Timmerman continues to travel around the globe teaching the arts he loves. At age 70; and, despite a major back injury he suffered while working as a cabinet maker at Sears, GM Rudy Timmerman has not slowed down much, and his 2011 schedule includes teaching seminars in Australia, Canada, Europe, and all over North-America.